I shop at Costco once in a while. Since last winter, I’ve been watching the price on a camping tent. Last week I gave in and decided that this summer I was going to finally give it a try, and drag my daughter along with me. I bought the tent, and the sleeping bags to go along with it. To my surprise the tent was half the price! It’s really nice – a five person tent with a sheltered seating area. Camping is one of the things I’ve been wanting to do for a long time but found it kind of difficult to do as my other half at the time didn’t want to go. This was my chance! Now I’m not going to blame everything entirely on him. 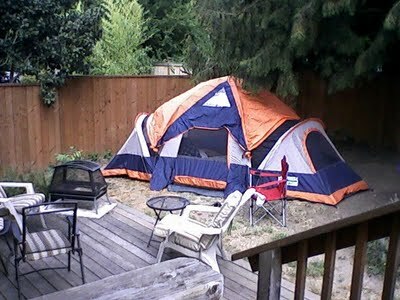 I’m also not the “roughing it” outdoorsy type. I’m afraid of spiders and such, snakes and whatever else is out there. But I’m working on getting over it (and it’s really hard work too). So on Friday evening I set up the tent in the backyard. It wasn’t as hard as I thought it would be. As I was setting it up, my daughter was creating a list of things that we would need for the night. We set up the inflatable bed, the camping chairs, took out the marshmallows, crackers and chocolate for Smores making, and the lantern for ghost stories. We were having fun! And we were outside! Ok, we weren’t TOTALLY roughing it. We still went into the house to use the washroom, and grab food, but it was good for the first dry run. Then it was time for bed. She fell asleep easily, and I lay there awake, listening to everything around me. I’d like to say it was the sounds of nature that I was listening to, but I don’t remember any animal or insect sounding similar to air conditioners, sirens, or car engines. It was spectacular trying to make out the sounds of true nature over the urban noise pollution. The more I tried to sleep, the more I heard patterns between the three. It was like a symphony!! I knew it was supposed to rain overnight, and the thought of rescheduling our big camp out crossed my mind. I’m glad I went along with the plans anyway. Camping out in the rain was friggin awesome!!! Hearing the big, heavy raindrops hitting the tent, the trees and weeds was amazing. It cancelled out all the other noises. Even as the thunder rolled in for a bit, it was tranquilizing. I felt like I was in a cocoon, a womb even. I was warm and protected from the elements, like being in a nice, soft yet strong embrace. Being in the rain, I was able to softly drift off to sleep. I imagine that being in the wild, really camping, would be similar to this. Being surrounded by nature has a calming effect. We humans need to get back to our animal roots. We need to re-energize. I’m looking forward to the next camp-out. I’m going to make sure it rains overnight again! The next morning was quite amusing, waking up, hanging out in the backyard enjoying my coffee, and watching my retired neighbours come out one by one to tend to their vegetable gardens and look over my way with puzzled looks on their faces. They couldn’t understand what I was doing, and surely thought I had gone mad. No one has done such at thing there before. I don’t mind. I intend to do it again a few times before the summer is through. But ntil we can do this again, maybe for a quick weekday spur of the moment thing, we’ll just sleep with the window open. That sounds like a great place to live. Must be very peaceful! It used to be until the subdivision moved right up to our property line…lol! You picked one of the best things to do for relaxation. Done camping so much over the years, it’s so fun. Ontario has so many beautiful places to camp and nature things to do. It should be a must for everyone to try it. I’m planning to check some of those places out this summer! It’s about time I do! I can’t wait to do the same with my kids!! !